In this article, we will be continuing the process started in our previous article detailing Claims case intake. This article is a direct continuation of that article, and as it is vital to the content in this one, please review it carefully. Once the Claims case has been assigned to a specific Staff member and established as a fully functional Matter, it should currently be in Intake status as indicated in the screenshot below. From here, we can now begin the Workflow processes associated with this particular Claim. To begin, find the Matter you wish to work on and select the “Workflow” tab from the top of the Matter, as indicated below. From here, you will be able to see the processes currently associated with the Claims workflow. Each task assigned to you will be displayed in a chart format with a varying number of steps that must be completed. These tasks are known as Todos. When the Claim is in “Intake” status, there will only be one task to complete, which is to confirm the Claim has been received by the Legal department. To advance this workflow to the next set of tasks, move the task from the “Incomplete” column to the “Completed” column. Doing so will change the status of the Claims Matter to “Review” and return us to the main Matter. From here, we can proceed to the Workflow tab once more, where a new set of tasks will be ready for us to complete. Each task once advanced may create new work items for you to complete. We will have a listing below. Of particular note is the “Proper Presentment Made?” task, which when moved to either Improper Presentment or Proper Presentment, will also advance the Status of the current case. As you advance tasks in the Workflow, new documents will be generated related to the tasks you are performing as well. Be sure to check the Docs tab for them. 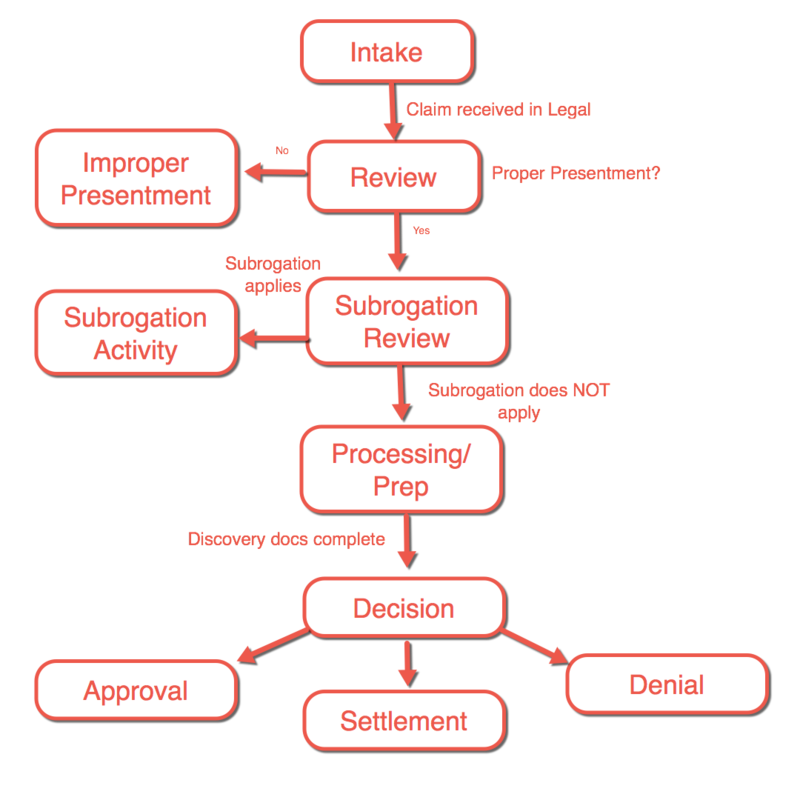 Below is a flow chart of all the current workflow we have set up for Claims cases. This should assist you in navigation of the Claims workflow. As you advance the case through it’s Workflow processes, take note of the Key Dates, which can be accessed by clicking the “Key Dates” tab at the right hand side of the Matter. This tab will allow you to keep track of critical case dates at any time.